This morning brought clouds and a humungous amount of humidity. It is monsoon time in the desert…stifling! But, out for a hike, I must! For an unknown reason, I chose to walk Sophie along a path that I don’t often use in the summer. It took me toward the canal at 40th St. Mumbling to myself about what a questionable decision this longer walk was, I was looking at my feet wishing they would move faster to bring an end to this torture for me and the pup. 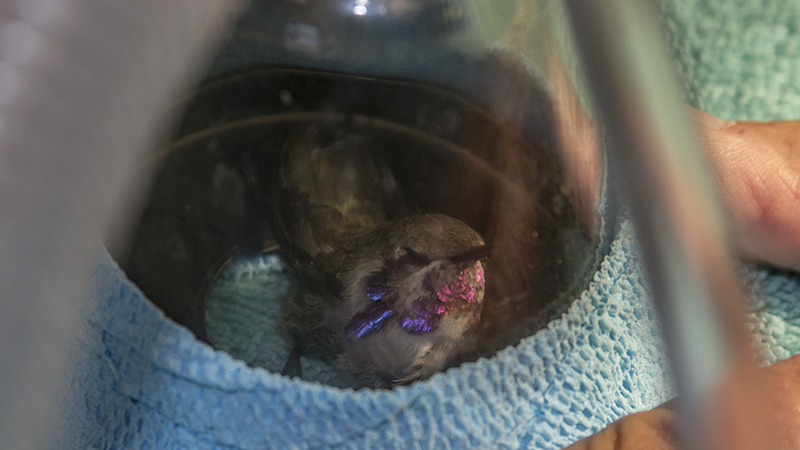 Thankfully, I was distracted from my grumbling by an infrequent but recognizable sound…a sort of consistent chirping. It made me look up! 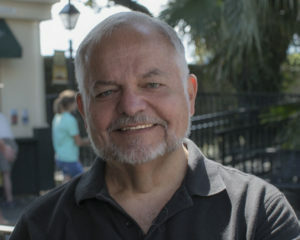 Sheezam! I was surrounded by a swarm of bats heading in from an evening’s feeding spree! 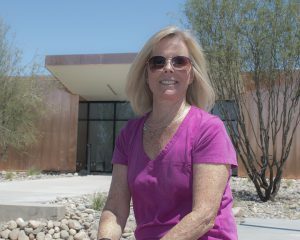 It was a total thrill that stopped me in my crabby tracks and in the midst of the oppressive heat gave me goosebumps. These flighted mammals were all around me. They came by my sides…both left and right. They came from above with members of the returning cloud swirling and twisting on unseen currents using echolocation to keep from tumbling into each other and me as they torpedoed into the opening in the culvert…thrilling! I didn’t stop watching until the last ones dove into the tunnel along the canal…a frequent spot to watch bats that I had totally forgotten about. As I turned around to continue my walk, the sky lit up with the rising sun flinging its rays in a splendid statement turning the horizon into a vibrant orange. What a vision! What a treat! What a great way to start the day! I suddenly felt a sense of hope and gratitude, and I truly think the weather changed or at least my interpretation of it did. It made the rest of my walk a meditation of thanks to the natures that surround us. I thought about the fact that I hadn’t seen many mosquitos this year and gave a huge thanks to these intrepid little hunters who spent the night before blitzing on the resident mosquito population. Yep, and I gave another nod of support to our local bat population. I noted the time of this occurrence and hatched a plan to make this a more regular part of my morning routine. Then, while driving in to work, I reflected on my new found sense of hope and looked up to see that a billboard which is usually obnoxious had been replaced with this: Fear is contagious, but so is HOPE. Spread the hope contagion…synchronicity at its best. Maybe I should buy a lottery ticket! The intake total for the year is now up to 7425. Although the intake numbers have dropped off, it has been a bust two weeks since the last update. As of yesterday, we have ended the public hour tours for the month of August (it’s just too hot for the birds – and the volunteers!) 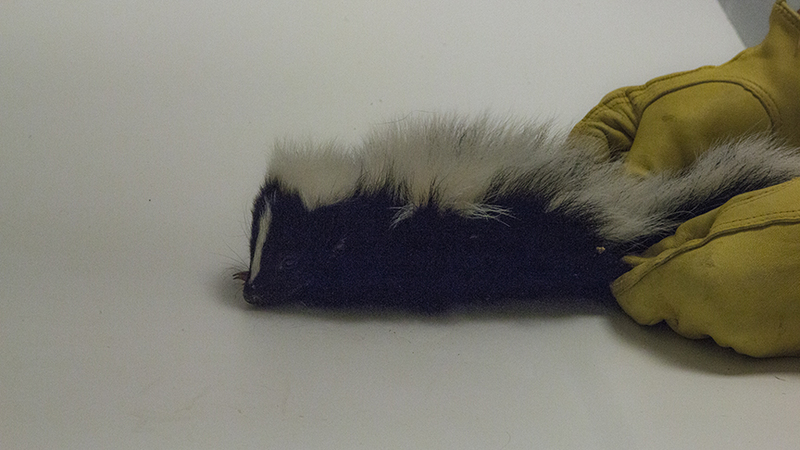 which will give us a chance to work on some projects for the upcoming Fall and Winter Education season. We are frantically writing and organizing for the next issue of our annual magazine Wing Beats, and we are running at full speed towards Wishes for Wildlife 2018 to be held on October 20 at the facility for the first time! 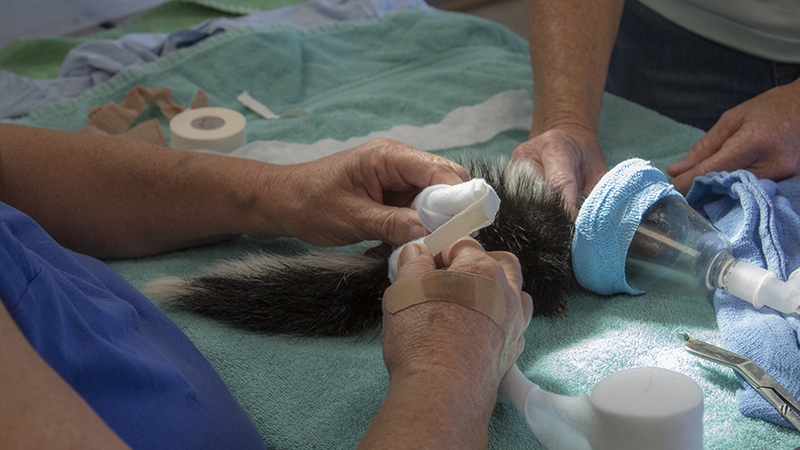 While all this is going on, the animals keep arriving, including a little skunk fresh from an automobile collision, and a hummingbird that somebody must have mistaken for a vampire as he had a stake driven into his chest! 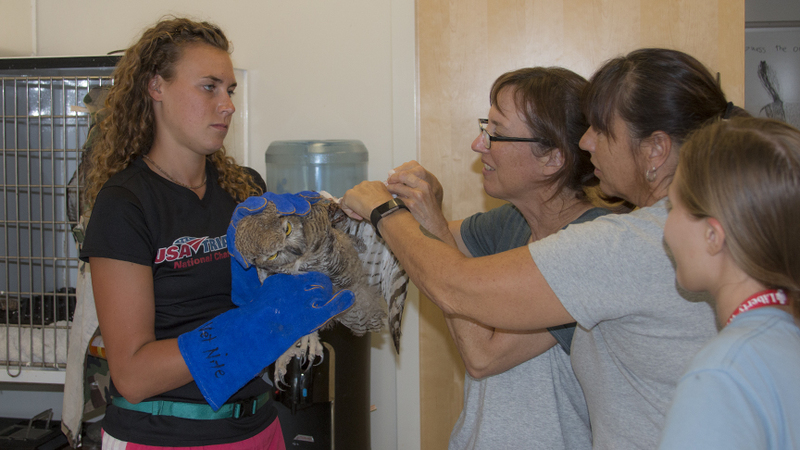 New Med Services volunteers are in training, and we hosted an eagle conference at Liberty last week. All this and more in this update! 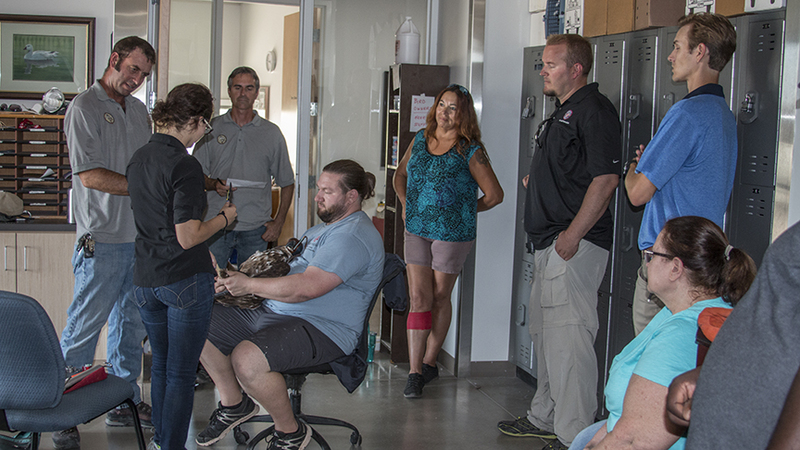 Liberty Wildlife hosted the Southwest Bald Eagle Management Committee meeting, followed by the Southwest Golden Eagle Management Committee meeting last week. 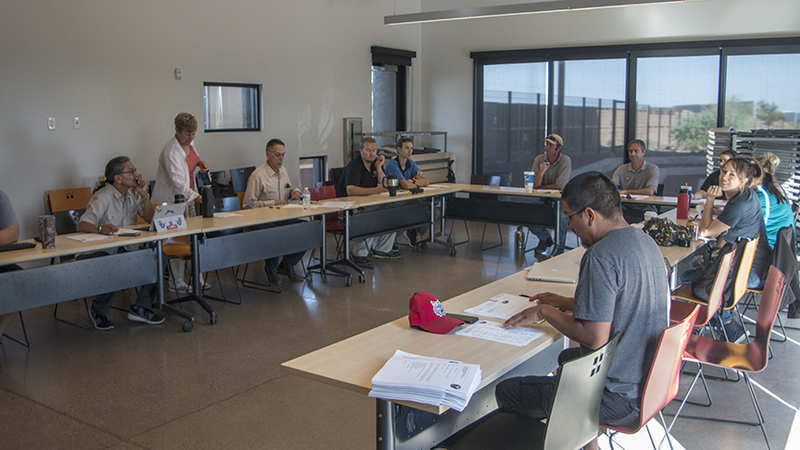 Reps from AZGFD, USFW, various other agencies as well as the local power companies and Native American tribes met in our large classroom and then toured the facility. 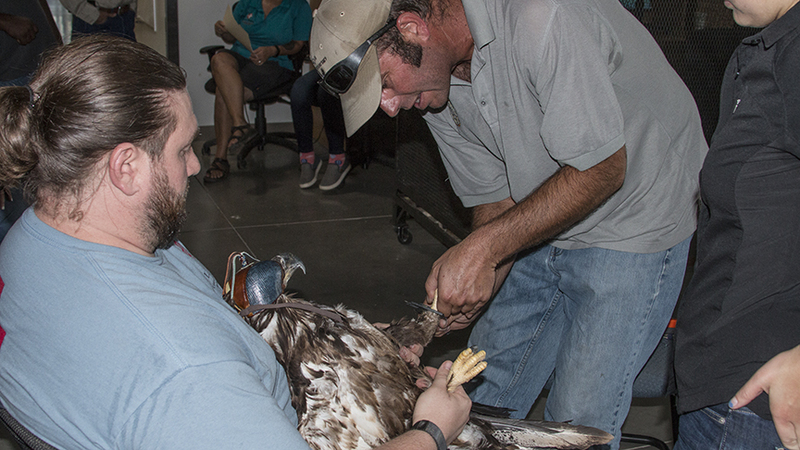 In the afternoon, some of the attendees got some hands-on training in measuring and banding as our soon-to-be-released young bald eagle was used for demonstration. It seemed like everyone was impressed with the facility. 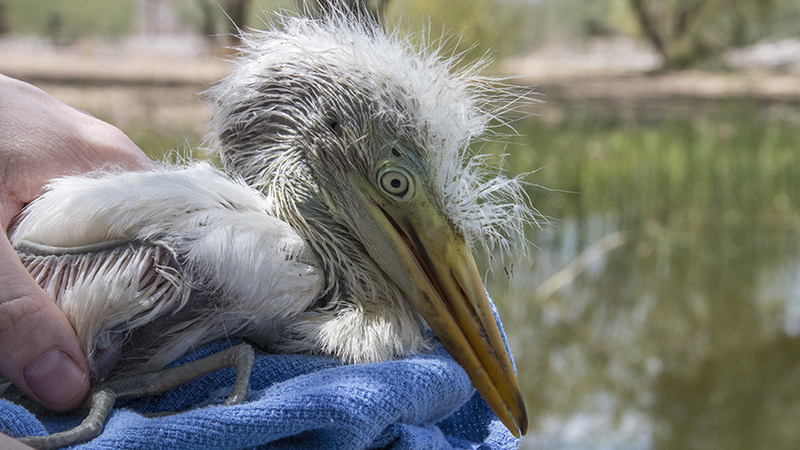 Having the wetlands on the property allows for better rehabilitation of birds and animals that hang out around water. 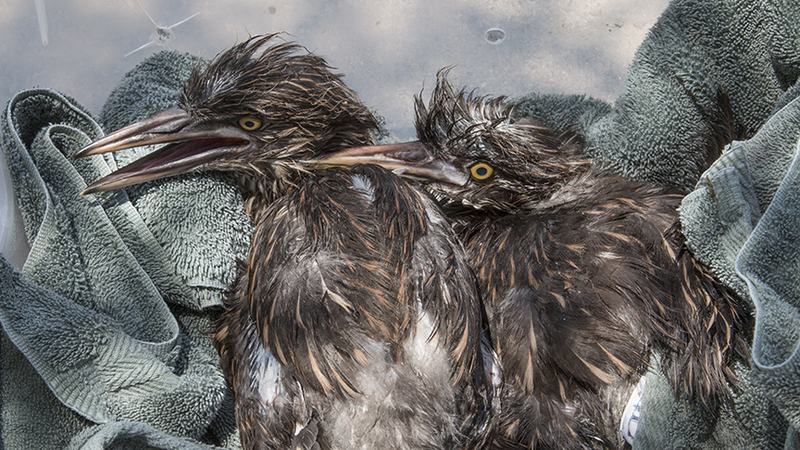 Waders like these herons are able to see and experience their natural habitat as they are raised at our facility. When they are eventually released it won’t be into a totally alien environment. 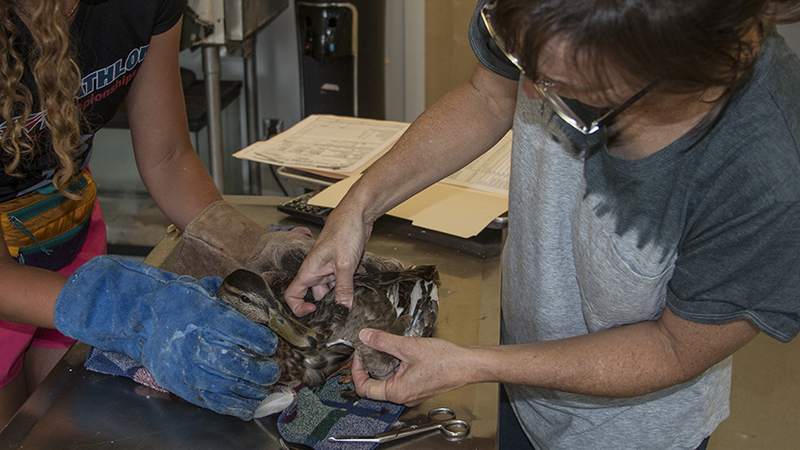 Ducks, mallards and domestics, sometimes have a tough time negotiating a world filled with perils that humans throw in their way, like fishing line and traffic. They never evolved to deal effectively with dogs, cats, cars and kids so most of the water fowl we see have had problems along these lines. 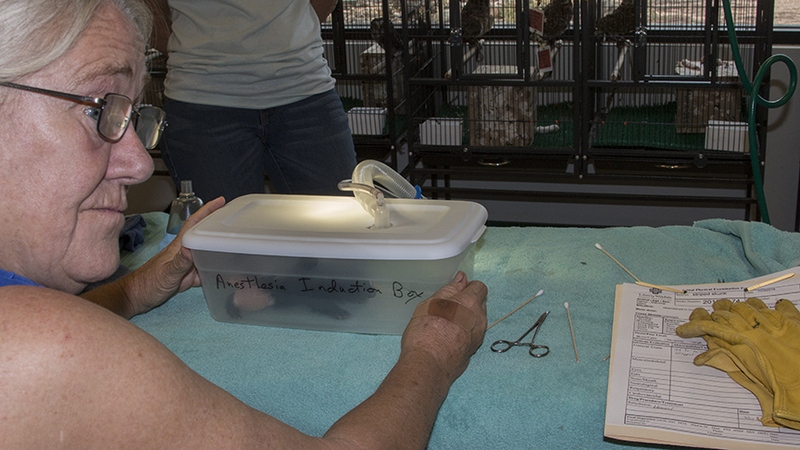 Training is one of the best things we offer at Liberty Wildlife, both for volunteers and our ambassador animals. 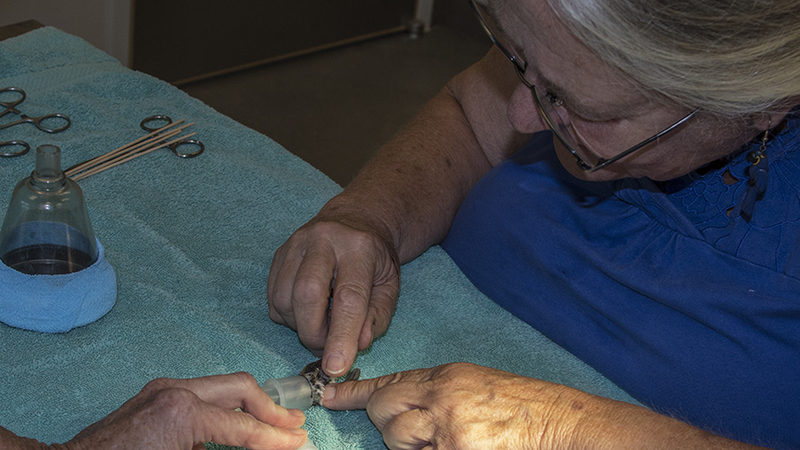 Jan has been working with some new Medical Services volunteers who are now being chosen for their background in medical operations and procedures. 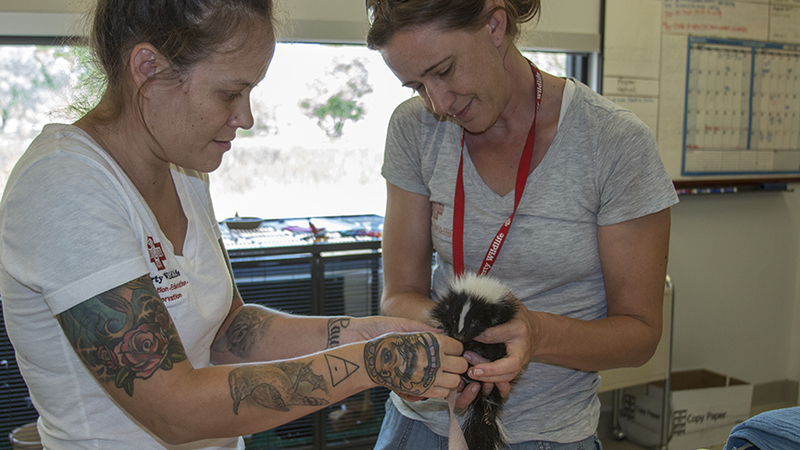 Both interns and future veterinarians gain valuable training caring for the injured and orphaned animals at our facility. Working side-by-side with Jan, Drs. Wyman, Orr, Sorum, Lamb, and Tantiyatyanon provides experience that would be difficult to duplicate anywhere. 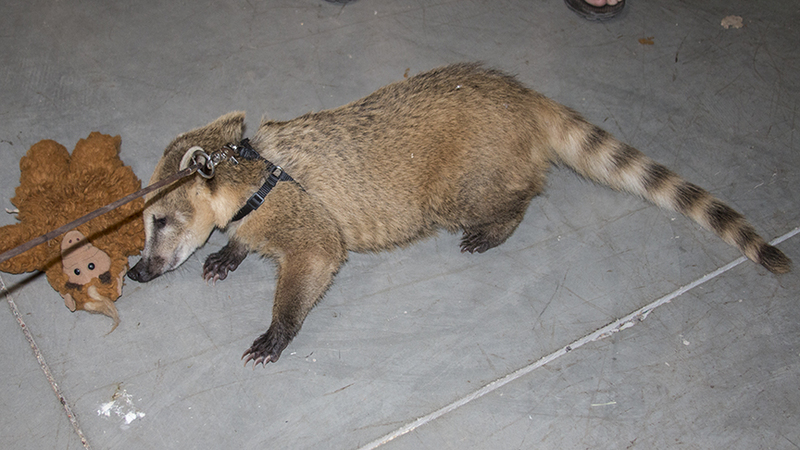 At the same time, our Educational animals also get some valuable training so they can be effective in their roles as educators. 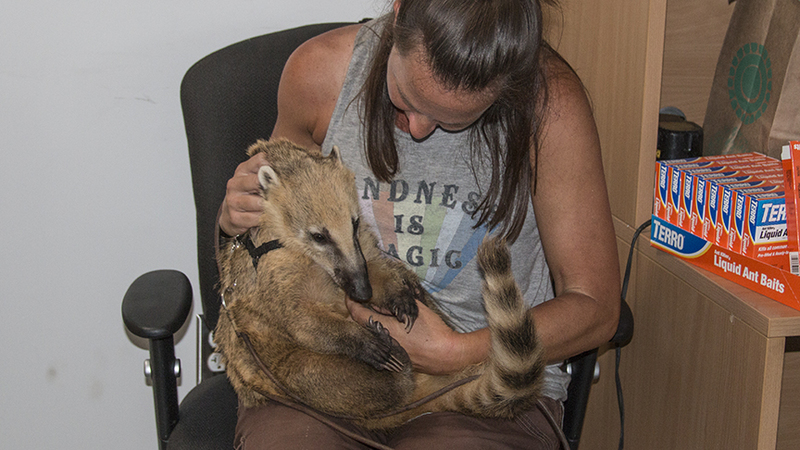 Laura has been training our coati, Groot, since his arrival a few months ago. Anesthesia mask becomes a chamber! 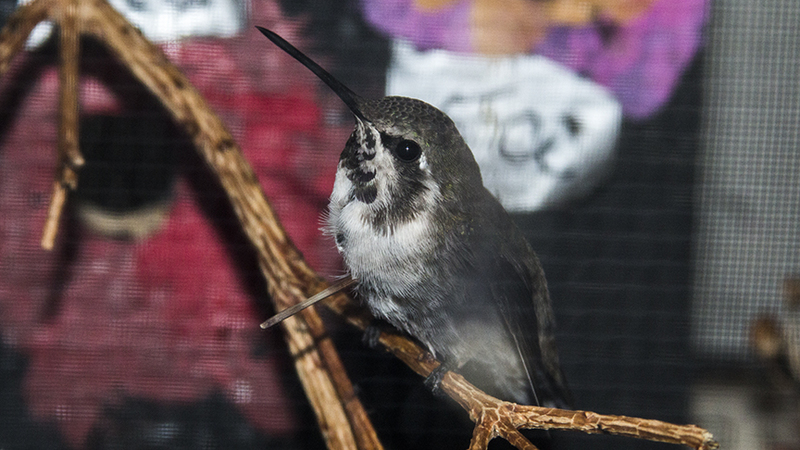 A couple of weeks ago, an observant person noticed a hummingbird flying around their home. 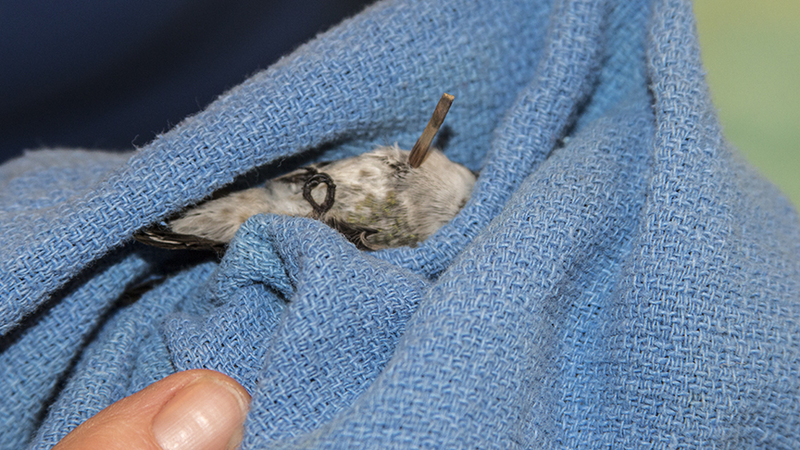 It appeared that the small bird had something stickling out of his chest that didn’t belong there. She built some traps in an attempt to capture the bird, and after several attempts, she was finally successful. She says she caught six or seven others before she finally got the target bird which she then brought in to Liberty. 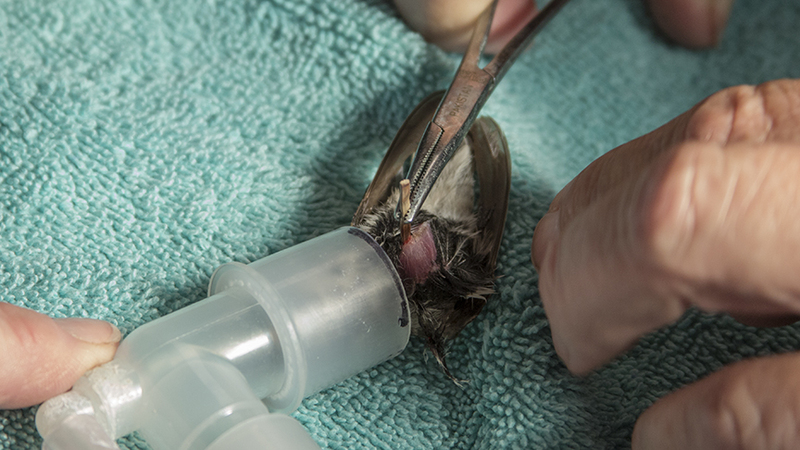 Some questions arose, like “How do you put a hummingbird under anesthesia?” and once you do, is there any way to maintain it to allow Dr. Orr to surgically remove the “stake” from it’s chest? 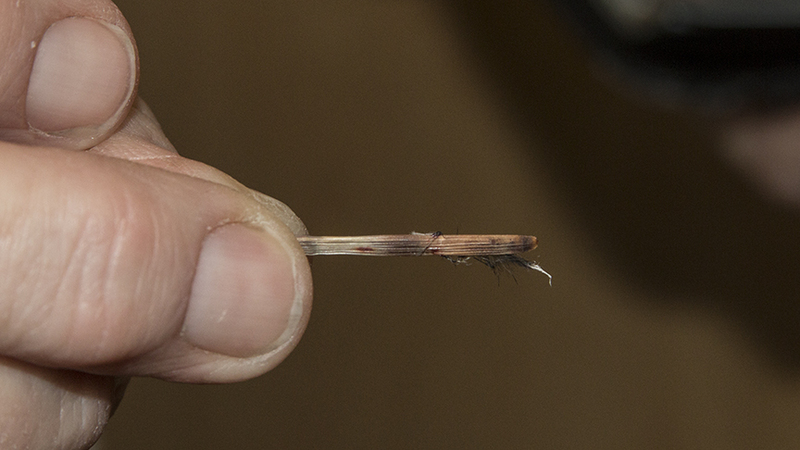 Both problems were overcome (see the pictures) and the offending object was removed. 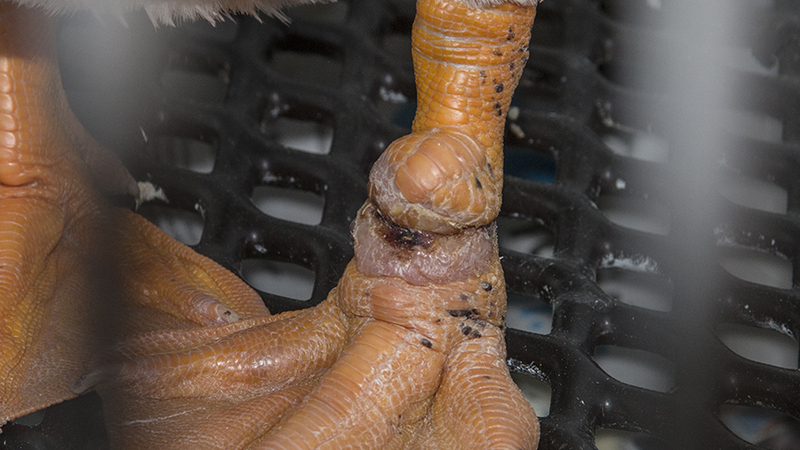 It appears to have been some kind of vegetation but how it got stuck into the bird is not known. 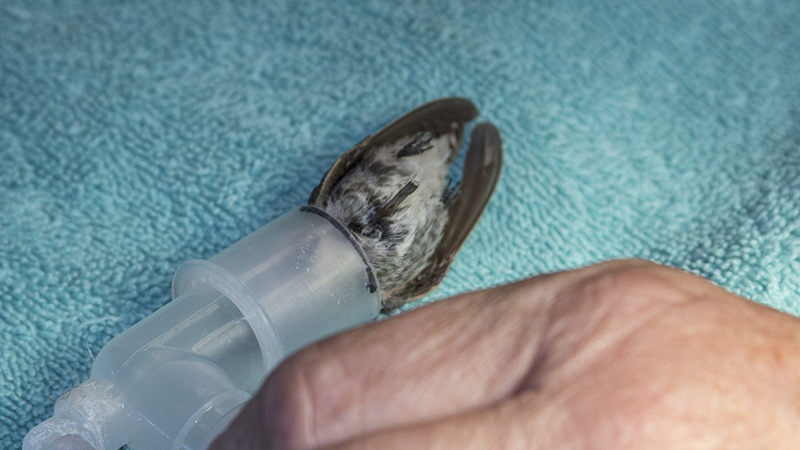 Luckily it didn’t penetrate anything vital and within a day or two of the procedure, he was released! 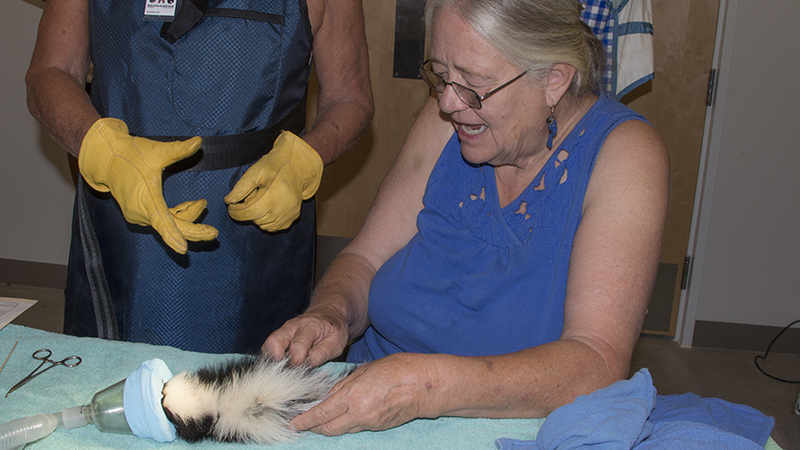 Recently someone brought in a little striped skunk that they had found on a highway near Cottonwood. 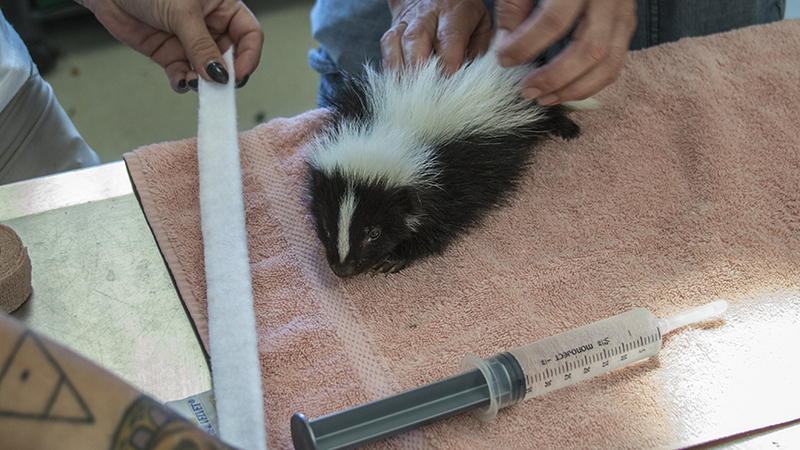 It’s mother was nowhere in sight and he appeared to have an injured leg. 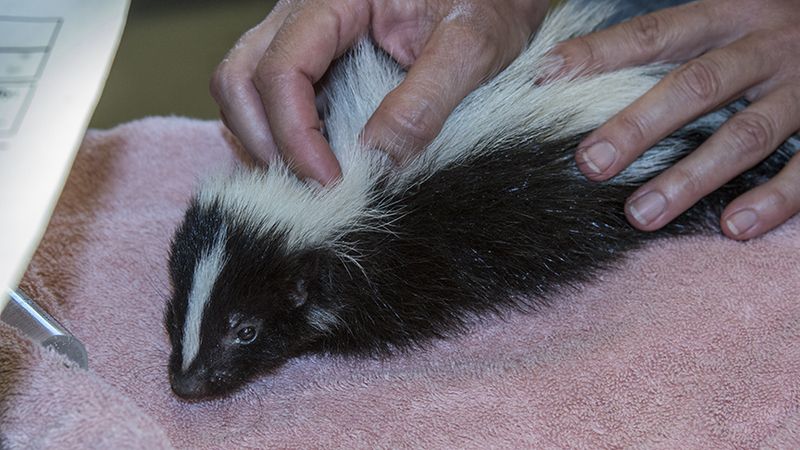 They were able to bottle feed it without being sprayed but knew he needed more help so he was brought to Liberty. He was originally assessed by Alex and Holly and was given fluids and a splint on the injured leg. 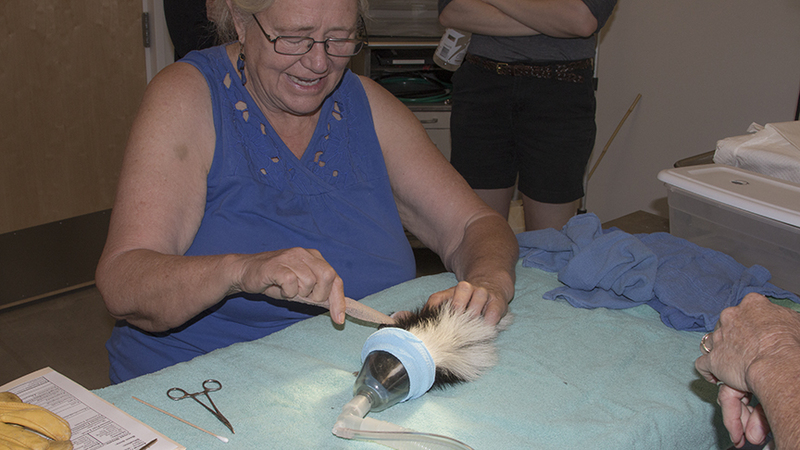 Later on, we made an anesthesia induction box for him which allowed Dr. Orr to do a thorough exam and obtain X-rays. 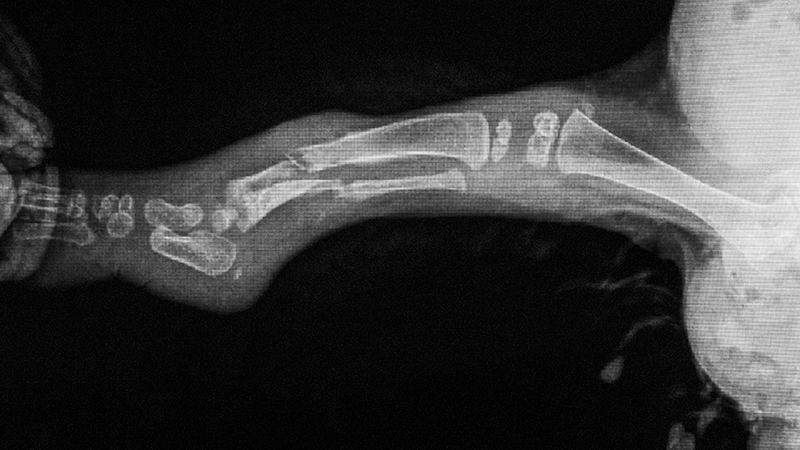 Since he is so young, it was thought his bones would heal well enough to allow for eventual release in a couple of weeks following a new wrap of the fractured leg. Liberty volunteers and docs are soooooo awesome! And I love your article on the Bats, Megan!! 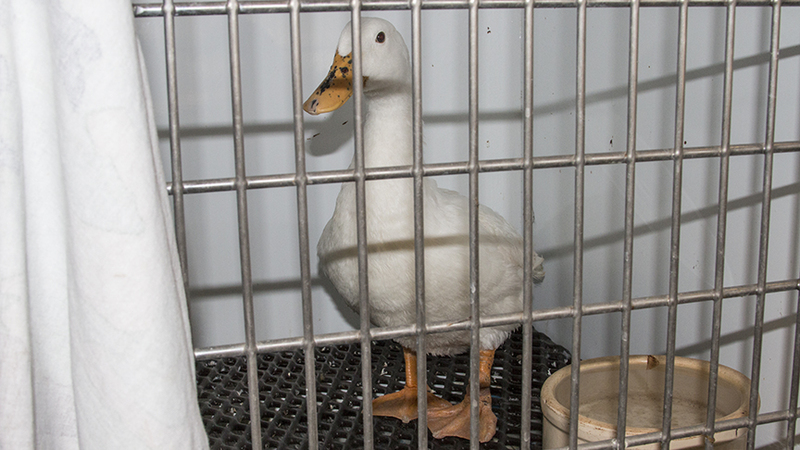 Help us reach our financial goals in treating 9,000+ animals per year. 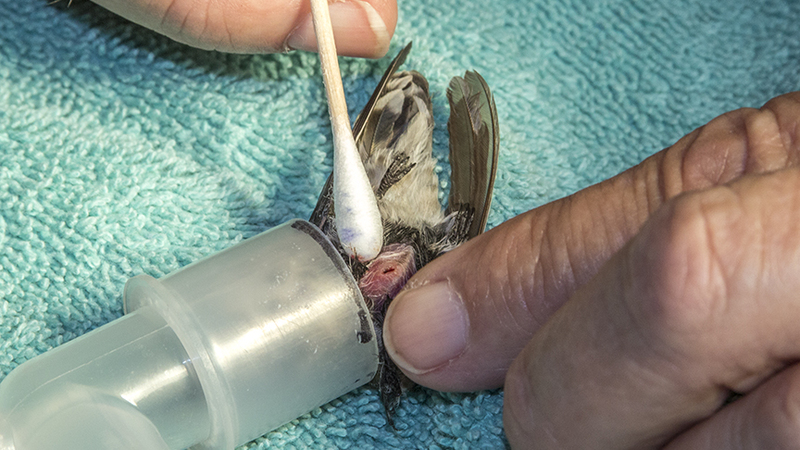 If you have a wildlife emergency and are in need of assistance, contact us immediately. If you do not reach someone right away, please leave a message and we will return your call as soon as possible. 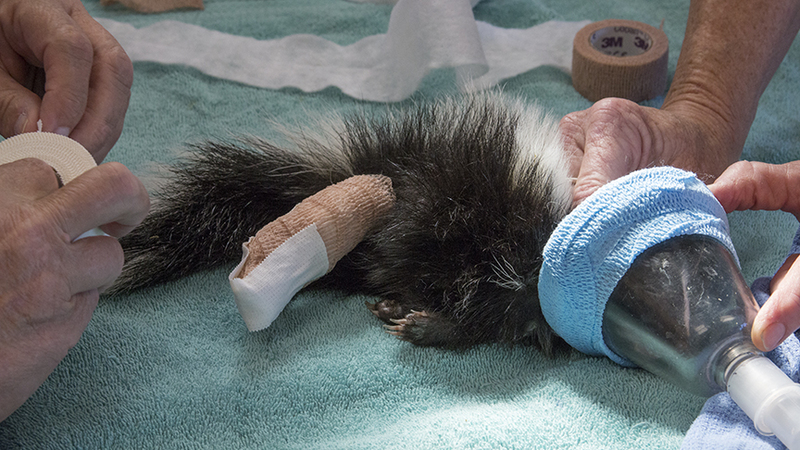 Have you found an injured animal in need of help? Bring them by our new facility.